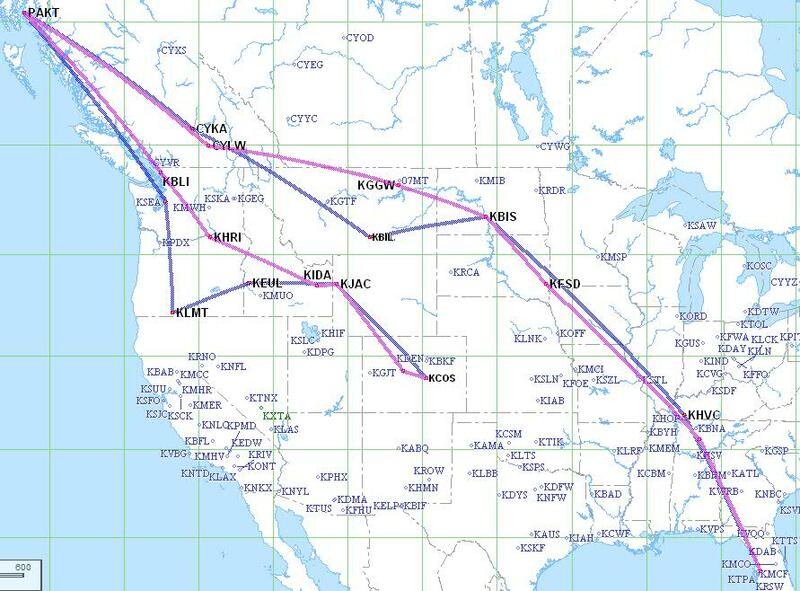 Migration was a great way for me to meet (and reacquaint with) fellow cirrus pilots from around the country. Of course, there were also a few cool, new products to see as well. While I definitely learned a few things, the highlight of the trip was a flight that I took with Trip Taylor. His plane was outfitted with the new R9 synthetic vision and he was gracious enough to allow me to tag along on one of his demo flights. The R9 "Syn Vis" is not yet certified, but Trip's plane has been reclassified as "experimental" in order to keep the plane flying legally. Because of all the terrain nearby, Colorado Springs was a perfect place to demo "Syn Vis". Let me know if you have any suggestions?? I have finally arrived in Colorado Springs and the journey was quite amazing! The blue line was the planned route. The magenta line was the actual route. As you can see, I tried to follow my plan. But needed to make lots of adjustments along the way. I landed and topped off minutes before it started pouring! After the storm passed, I continued to Sioux Falls, SD where I did my first overnight. The next day started mostly as planned Sioux Falls,SD > Bismarck, ND > Glasgow, MT. 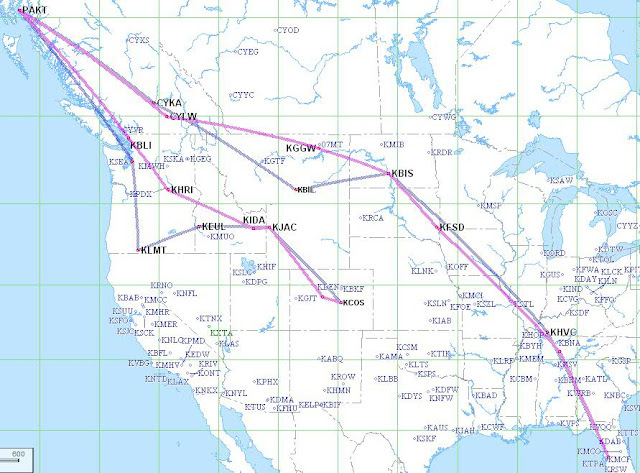 As I made my final Preparations to enter Canadian airspace, the Canadian authorities (Canpass) informed me that the Kamloops customs was "Closed for the day" So I had to pick an alternate destination and chose Kelowna, British Columbia. With a new destination, I entered Canadian airspace for the first time to find more surprises. While crossing the Rockies, Edmonton ATC informed me that radar coverage would be "lost over the Rockies", which was not very comforting! They gave me a frequency and told me to "try calling Vancouver" in ~ 30-45 minutes. Luckily, the weather was good and of course the view over the Rockies was breathtaking. After that landing (and enjoying Alaskan hospitality and seafood), I thought that Ketchikan would be the highlight of the journey. But after a couple of more states, the real highlight of the trip materialized in Leadville, CO. Lake County Airport in Leadville, CO is the highest airport in North America @ 9927 MSL. I landed there on a precision approach with a "circle to land" into an 18 KT headwind Gusting to 28 KTs, (Perhaps NOTmy most elegant landing... But certainly one of the most difficult and satisfying landings I had done in a long time. 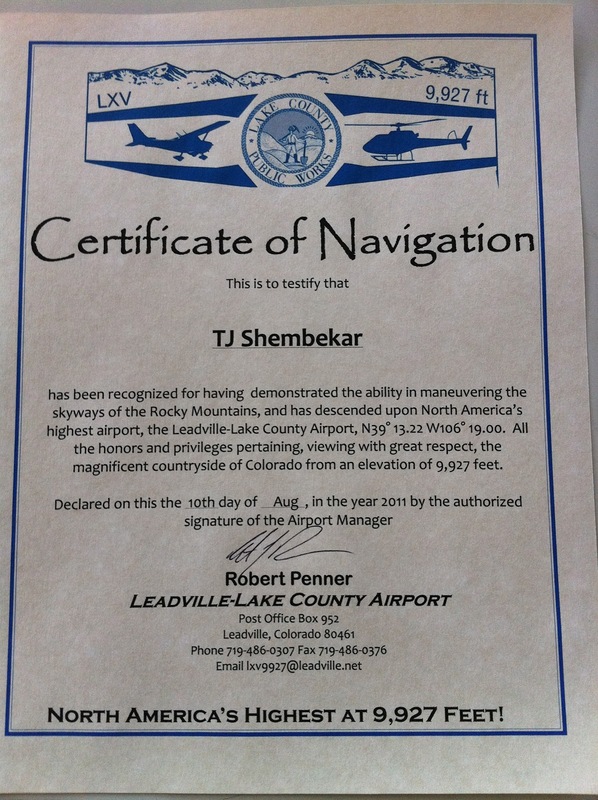 As you can see from the pic below, they really do issue certificates for landing there!! After Leadville, a short 20 minute flight to Colorado Springs and I was warmly greeted by the staff of Colorado Jet Center. So after this incredible journey, I am now ready for the main event (Migration 9), which is scheduled to start tomorrow morning.